Elvis Presley (1935 - 1977) was an American singer and actor. He is known worldwide by the nicknames The King of Rock, or simply The King. 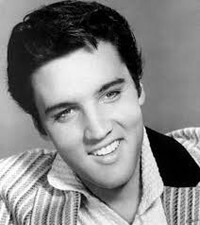 Elvis is one of the most successful and popular solo artists of all time. Elvis distinguished himself from his contemporaries by his then controversial hip-swiveling appearances, the combination of blank looks and singing with a 'black' voice. His appearance was on: for that time long hair, sideburns and later jumpsuits. His rousing style distressed established postwar society which he had to endure a lot of criticism. For his pioneering musical work, he gradually became honored and especially after his death in ever wider circles. Presley is now being recognized as one of the founders of modern pop music, along with, among others, The Beatles and Bob Dylan. John Lennon of the Beatles put it this way: Before Elvis there was nothing.